From his childhood onward, Alec Stevens was profoundly influenced by the music of many disparate cultures. Even in his toddler years, an odd amalgam of his parents' records made their way to his turntable: Theodorakis' "Zorba the Greek" soundtrack, Chet Atkins 45s, Brazilian music (both native and urbane), the classics, etc. His first instrument was a xylophone, followed in late 1978 by the guitar. At first influenced by his older brothers' interest in Jimi Hendrix and 'hippie generation' rock, Alec played in several (short-lived) bands in his school days. He later became enthralled with 'progressive rock' and modern jazz, and in late 1989, put together a band which played the club venues in Manhattan's Greenwich Village and elsewhere, eliciting some A&R and management interest. But, having surrendered his life to Jesus Christ (again, spoken of in somewhat greater detail in the 'Spiritual Biography' section), Alec harbored a growing conviction that he should not be performing in such worldly venues. His bandmates in The Quest, also professing Christians, conceded, and they made music in various churches and Christian outreaches throughout northern New Jersey before calling it a day in late 1993. "In 1989 when I attended my very first church service in many years, I was fortunate enough to be in a congregation where the musicians were true worshippers of God. I make that distinction, because Psalm 22:3 tells us that God inhabits the praises of Israel (the Old Testament believers and the New Testament church). It is such an amazing dynamic that I dare say that the world's best musicians and songwriters leave me untouched, spiritually speaking. They might stimulate the soul (the intellect and the emotions), but my spirit is unmoved. The Bible tells us that man since Adam's fall has been born in this world spiritually dead, and the Lord Jesus Christ said that 'except a man be born again, he cannot see the kingdom of God' (John 3:3b). My spiritual eyes have been opened, and I see an entire dimension that the world's music can't touch---indeed, that it can't even recognize, but which is quite real and most vital." 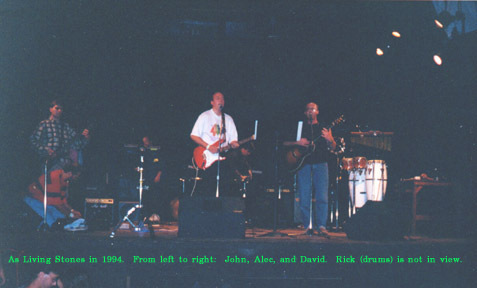 In 1994 Alec formed another band, As Living Stones, which did not last the year. "We played several Christian venues, but something didn't seem quite right. I blame that on no one but myself. Now I see clearly what it was. I also played guitar in my friend Wayne Scott Farley's band, Force for Good, in 1995." Over the next three years Alec served as the worship music leader in his home church, gave solo concerts of his own music in Pennsylvania, New Jersey, and New York City churches and Christian coffeehouses. "God was changing my heart over these years. The hard rock music was no longer on my turntable/tape player/CD player. Finally, no music of any secular type was played in my home---classics, jazz, ethnic, et cetera. I did not receive any Divine mandate to do so. It was my choice, a desire to see my musical motives purified. Only worship songs, and even there, only truly consecrated songs that clearly exalted the Lord Jesus Christ were on my lips and in my mind. Such was my goal, at any rate. "I think it's really difficult, especially for a Christian, to study or listen to secular music without being deeply influenced by it. 'All the earth and its fulness is the Lord's', as the Scripture says, but 'without faith it is impossible to please God'. Granted, one can learn much of the 'mechanics' of music from secular 'masters', but music is a language---soundtrack musicians consistently prove that---and, music theory aside, what are they saying in their work? Surely they are not singing the praises of their Creator. My litmus test for the instrumental side of music (Christian lyrics aren't enough): if they violate the fruit of the Spirit (listed in Galatians 5:22,23), then they are at least suspect, and most likely disqualified by Providence. 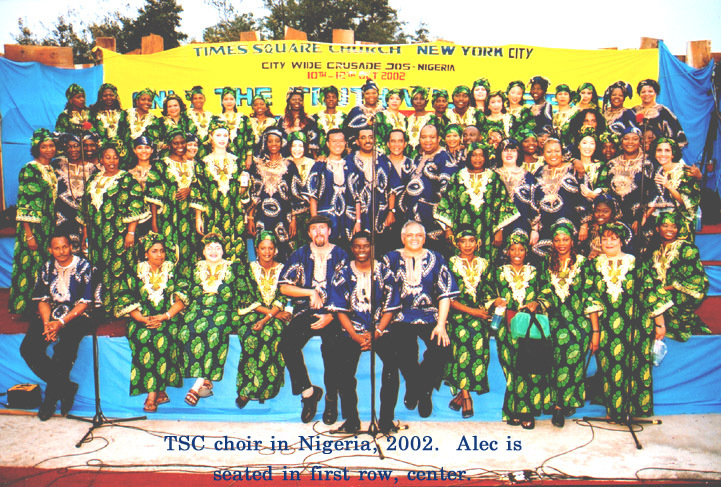 Back at Times Square Church I occasionally shared solo songs of my own composition in several services." Today, God has placed other ministry duties before him, such as leading worship and Bible studies with Times Square Church's drama team (in various locations such as the Inwood House for single teen mothers, Ward's Island for homeless, and Covenant House). Of this, and a home Bible study wherein he also leads worship, Alec says, "Souls are being saved, and my heart rejoices." He continues to hone his personal repertoire, and hopes to be in the recording studio in the near future, God-willing.